We, the beauty world, collectively took a hot sec to switch our focus from wild nail art to crazy brow trends. But I'm here to tell you that nail art is back with a vengeance—this time in the form of teeth-shaped nails. You heard me right: nails that look like teeth, specifically molars. 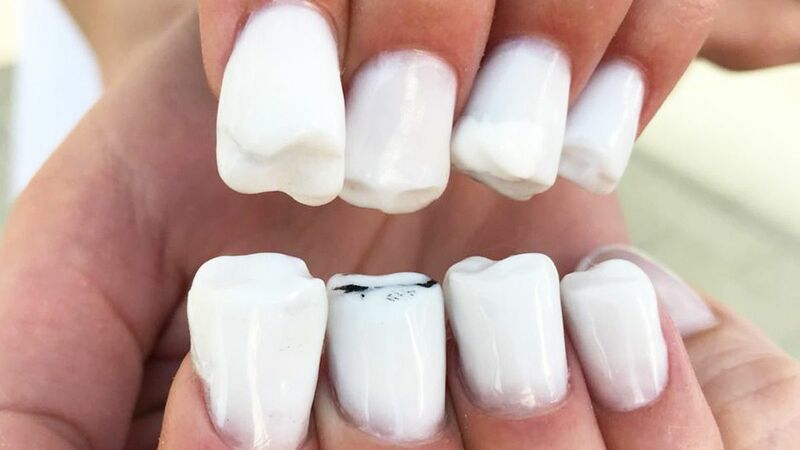 Like the start of any acrylic nail look, a nail artist uses their incredible skills and a brush to mold the acrylic into the desired shape—which, in this case, is a tooth. On one nail, it appears the artist even added black polish to give the look of a cavity. These teeth are equal parts amazing and weird, and we're really trying hard not to cringe.